Microsoft Frontpage 2000 has a convenient web administration, a very nice user interface, some nifty components and extensions. It is so much better to handle than its predecessors with the slow and obscure server and the primitive editor. 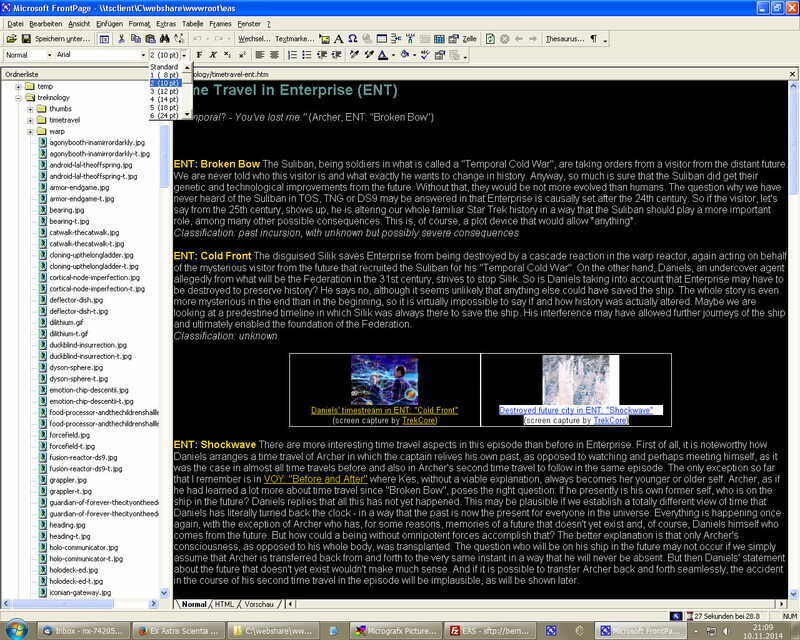 Frontpage 2000 could be an excellent software for web design - if only the very basic functions would work as intended. My pages are all supposed to be plain HTML, I don't use any plug-ins, let alone Frontpage server extensions, so proper HTML is of utmost importance. It wouldn't be quite as bad if it were only for the redundant and badly formatted HTML code, but the problem is actually worse. Frontpage creates arbitrary HTML code, HTML font styles which can't be edited in WYSIWYG mode any more, and changes the code, all of which remains unnoticeable until it's viewed in the browser. The following is a small demonstration, with code as created by Frontpage. Original code from here (in an iframe to override the CSS). Depending on your browser settings, you may not see all problems, especially if you have set the default font to Arial. So why am I still using Frontpage? Well, in many respects Frontpage 2000 is way better than its precursors that needed the awful server that had to be started each time I wanted to edit my web. Sometimes my pages were not loaded completely from my local hard drive because of server timeouts! Frontpage 2000 web administration is much faster, and the new editor has several nice functions for convenient editing which I wouldn't want to miss, even if the final result often looks different than Frontpage made me believe. Supplement I checked out Macromedia Dreamweaver as an alternative, and the HTML editing as well as the generated code was quite nice. Especially the menu that changes automatically with the selected object type is a very good click-saving idea. I don't know how the software would handle a large web, though. The worst editor I have come across is Net Objects Fusion. I already screamed in terror when I read the manual that told me how to edit and move everything pixel-wise. After I have installed it just for fun, I now know why so many amateur web pages have messy layouts with misaligned text and images that look different in every browser.